The term epiphany means "to show," "to make known" or "to reveal." The Feast of the Epiphany had its origin in the Eastern Church. In Jerusalem, close to Bethlehem, the feast had a special reference to the Nativity. Today in Eastern Orthodox churches, the emphasis for this feast is on the shining forth and revelation of Jesus Christ as the Messiah and second person of the Holy Trinity at the time of his baptism. Usually called the Feast of the Theophany, it is one of the great feasts of the liturgical year. "Theophany" comes from the Greek for "God shining forth." The West took up the Oriental January feast, retaining all its chief characteristics, though attaching overwhelming importance, as time went on, to the visit of the Magi who bring gifts to visit the Christ child, and thus "reveal" Jesus to the world as Lord and King. The Feast is observed as a time of focusing on the mission of the church in reaching others by "showing" Jesus as the Savior of all people. The future rejection of Jesus by Israel and his acceptance by the Gentiles are retrojected into this scene of the Matthew’s narrative. King Herod reigned from 37 to 4 B.C. The “magi” were a designation of the Persian priestly caste and the word became used of those who were regarded as having more than human knowledge. Matthew's Magi are astrologers. As for the star in Matthew’s story, it was a common ancient belief that a new star appeared at the time of a ruler's birth. Matthew also draws upon the Old Testament story of Balaam, who had prophesied that "a star shall advance from Jacob" [Numbers 24:17], though there the star means not an astral phenomenon but the king himself. 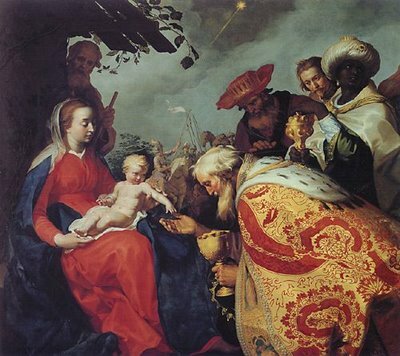 The act of worship by the Magi, which corresponded to Simeon’s blessing that the child Jesus would be "a light for revelation to the Gentiles" [Luke 2:32], was one of the first indications that Jesus came for all people, of all nations, of all races, and that the work of God in the world would not be limited to only a few. At home in their distant, foreign lands, the Magi had all the comfort of princely living, but something was missing– they were restless and unsatisfied. They were willing to risk everything to find the reality their vision promised. Unlike the poor shepherds, the Magi had to travel a long road; they had to face adversity to reach their goal. The shepherds also knew adversity, and it had prepared them to accept the angels' message. But once they overcame their fright, they simply "crossed over to Bethlehem" to meet the Christ child. It was anything but a romantic, sentimental pilgrimage that we often see in our manger scenes! The Magi from the East, foreigners in every sense of the word, were guided not only by their own wisdom and knowledge of the stars, but were aided by the Hebrew Scriptures that now form the Old Testament. The meaning of this is important – Christ calls all peoples of all nations, Gentiles as well as Jews, to follow Him. We could say that Jerusalem and the Old Testament serve as a new starting point for these Gentile pilgrims on their road to faith in Jesus. The people of the big city, indeed even Herod himself, were instrumental in leading the magi back to Christ! By disclosing to Herod the birthplace of the Messiah, the advisers became, effectively, collaborators in his evil intent. In fact it is they, not Herod, who will later bring about the death of the "king of the Jews." It is the "chief priests and elders of the people" who will plot to arrest and kill Jesus [Matthew 26:3-5, 47; 27:1-2, 12, 20]; "the scribes" are mentioned in 26:57 and 27:41. He was a threat to Herod and to them: to the throne of one, to the religious empire of the others. The negative reaction of Herod and his advisers, the chief priests and scribes, turns the infancy narrative into a veritable gospel. If we read the story carefully, we realize that far from being a children's tale, it is a tragic adult story. Already at Christmas we see a hint of the inevitable sacrificial death of this "newborn king" – the schism between a worldly ideology and a godly one. The battle lines are drawn and the forces are being marshaled. Matthew's Gospel shows us that right at the beginning of the story of Jesus, the one who is to rule Israel is greeted with the cheers of some and the fearful fury of others. 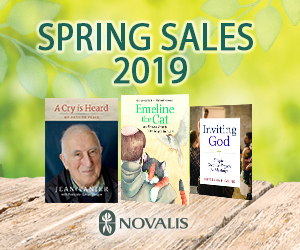 To those who are alert to the signs of the times and the places, the coming of Jesus is an invitation to risk and to embark on a journey of faith and a journey of life. A child is born at the same time as a death-dealing power rules. King Herod tries to co-opt the wise men to betray their journey, to end their commitment to future possibility and new life. At the centre of the whole story of striking contrasts lies a baby who is joy. Herod is afraid of this "great joy for all the people." Our societies and cultures are becoming increasingly afraid of human life-- the greatest joy for all peoples! We must recommit ourselves to life- preserving it, upholding it, blessing it and giving thanks to God for this greatest of gifts. Some of us are destined to find the Christ child only after a long, tedious journey like that of the Magi. Our worldly wisdom and worldly ways, our ecclesiastical façades need to disappear; we must make sacrifices to find our deepest meaning and peace that is Christ. Most wise people need to make quite a trek if they are to find any lasting meaning. Simple folk can usually find the Lord by crossing a field like shepherds; they bring their poverty, humility and simple openness. But knowledge, wisdom, power, prestige, and the lack of humility often lead to despair. People who believe they have the immediate, final truth and clarity about anything often are led into bleak, dead-end streets or they remain lost in the desert of solitude, self-sufficiency, selfishness and despair. In the end, the magi went their own way, and because they refused to be seduced by cynicism, because they allowed themselves to be surprised by this great joy, the star to which they had committed themselves appeared again. This is not only the description of the times into which Jesus was born, but also our times. When we have found our lasting joy in the midst of the encircling gloom, cynicism, despair, indifference and meaninglessness, the only thing to do is to kneel and adore. If we are truly wise, let us do what the wise astrologers did. When we hear the voice of the old king of death and fear and cynicism, let us have the courage to go our own way... rejoicing. The star and the journey will send us onwards, by newer paths, to come into the presence of the Child of Light and the Prince of Peace, who is the fulfillment of humanity's deepest hopes and desires for light, justice, love and peace. From the beginning, My Church has been what it is today, and will be until the end of time, a scandal to the strong, a disappointment to the weak, the ordeal and the consolation of those interior souls who seek in it nothing but Myself. Yes...whoever looks for Me there will find Me there; but he will have to look, and I am better hidden than people think, or than certain of My priests would have you believe. I am still more difficult to discover than I was in the little stable at Bethlehem for those who will not approach Me humbly, in the footsteps of the shepherds and the Magi. It is true that palaces have been built in My honor, with galleries and peristyles without number, magnificently illuminated day and night, populated with guards and sentries. But if you want to find Me there, the clever thing is to do as they did on the old road in Judea, buried under the snow, and ask for the only thing you need– a star and a pure heart.